Work is currently under way on a new shopping center development called 'Downtown Plaza'. It's located in central Udon on Udon-dutsadi road near the fountain circle. 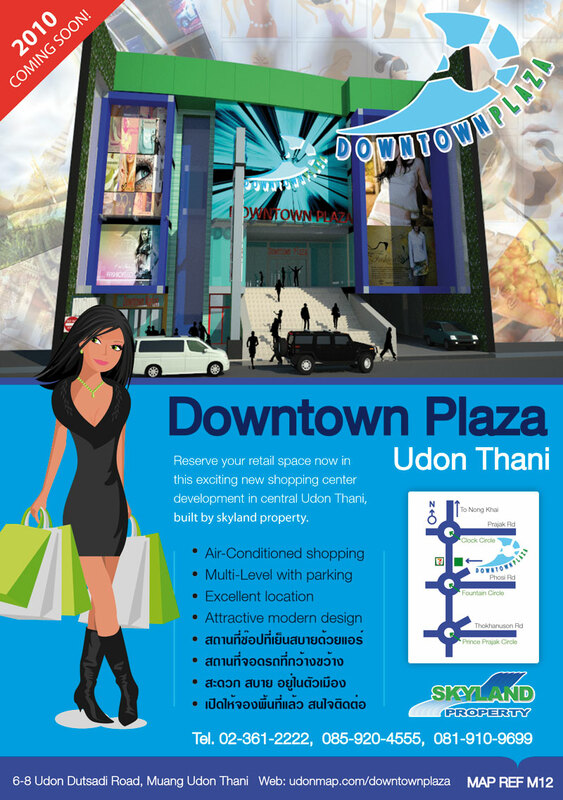 The multi storey in-door plaza will be fully air-conditioned, have underground parking and a modern attractive design. Several floors of retail space is currently on offer to rent. If you are interested in reserving a location please contact Skyland Property on 02-361-2222, 085-920-4555 or 081-910-9699. Downtown Plaza's estimated completion date late 2010. Look at the number of shopping bags that girl is carrying! It looks like Udon is getting up in the world.Investors must think there's some money in the area or they wou'dn't be putting in these stores. Wow! Is that a multi-level car park I see ? Right near ha-yaak wunwai (worrisome 5-way roundabout). With all the double- and triple-parked trucks on- and off-loading in that vicinity, should be comical. The building looks a lot like an electronics outlet store that's in that vicinity currently. Is it the same building? Texpat wrote: The building looks a lot like an electronics outlet store that's in that vicinity currently. Is it the same building? No its not the same building/company. There was a hotel in this location before it was demolished to make way for this new shopping center. "somebody is actually planning to make Udon the next "boom" town"
We've been here 13 years and there's no denying that Udon has grown by leaps and bounds. But take a walk into Index, Homepro, the half-dozen or so resorts that have opened near Udon, most of the hotels, and many of the surrounding stores (Tesco, Big C, Makro excepted) and you'll wonder how these place make any money. I know the wage scale is very low, but no matter......you've got to have customers to make money. It's rare to see more than a dozen cars in many of these parking lots, even on weekends. Yesterday we ate at the Na Ka Bu Ri Resort, located 15km outside of Udon on the way to Nongkai. Upscale (for Udon) place, lots of nice landscaping, pool, conference center, big restaurant, 44 superior rooms, 4 delux rooms, 12 executive villas, and 1 family suite. There wasn't a single occupant in the place when we were there, and we were the only customers in the restaurant. A business like this would never survive in the US. The food was fine but was at the high end of the price range and that'll keep most local Thais away. Another resort closer to our home opened 2 years ago...did a booming business for the first month or two, then their service/quality of food went down and prices went up. End result was no customers. Yet, the owner is building two large dormitory-like additions to the resort. Same same with all the subdivisions going up in town. The wage scale is so low for folks in Udon, one can only wonder how they afford such places. The two daughters of a noodle stand that we frequent are both recent college grads. Both have been unable to find decent jobs. One helps mom and dad at the noodle stand, another helps an aunt at her dry cleaning business. There's a multi-storied car park near the fountain circle....went up a few years ago. The entrance ramp is outrageously steep and I've never seen a car enter/exit. I haven't paid much attention, but my guess is, it's unusable. Personally, I'm happy with all the additional shopping opportunities, eating establishments, hospitals, etc. that have come along in the past 10+ years. But the way some folks do business here makes me wonder if they have a plan or just have money. Fully agree with Parrot. Went shopping for a few Xmas presents this week. Tesco(new one)Carrefour and the Central Plaza. All appeared to have more staff than customers . In Robinson I was actually given discount vouchers to use in any department, 30% off . Its Xmas/New Year shopping time, traditionally the busiest time of the year. If they are struggling now, what s going to happen the rest of the year .I know the news are reporting sales in Oxford st, London are down but I don't think they are opening new shops every week like Udon . The stores will be packed for New Year shopping. 99% of the Thais you see shopping for gifts in the store today aren't buying Christmas presents....they're buying for the new year. If the stores aren't packed in the final week of the year, that'll be a sure sign that either the economy is out of whack, or Udon has finally built too many stores. If ojne looks at Korat, and Kohn kaen, whose centres are disorganised, and basically as Udon does have in square footage enormous potential for shops and also has the ability to draw customers form not only Thailand but also Laos, then it is hardly surprising that it is growing. The Towhn centre of Udon was in fact larger than Chaing Mai's but as I have not been there for a few years that may be out of date. Although Korat likes to think it is the hub of issan, in fact I always believed that Udon Thani was and is now becoming Number 1 town in Issan. So any investment is welcome, I just wish they would think of updating the infrastructure in a planned sensible way, I am waiting with batd breath for a traffic accident fatality outside Macdonalds, which is liable to happen due to sheer incompetence in planning etc. Has anyone ever parked in the new carpark, across from the Ford Dealer, near the fountain circle? It was built about 2 years ago....maybe 6 stories.......but has an outrageously steep entrance ramp. I don't pass it often, but have never seen a car enter/exit. My guess is it'll never be used. Anyone have any firsthand experience?